After adoring all the high end designer lehengas in the world, lets come back to the reality. It’s not everyday that we can invest in expensive outfits. But we all want to look special. Especially during the festive season. 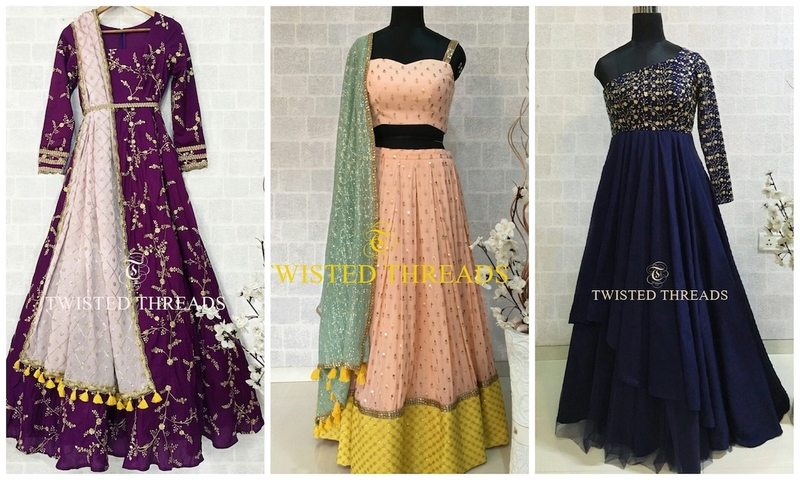 Twisted Threads is an Instagram Lehenga, ethnic wear store that I discovered few months . I knew a lot of you have a budget of usually INR 5000 to INR 15,000 for lehengas. Twisted Threads pretty much covers this price range with all their outfits. If you’ve been following the lehengas on Frugal2Fab Shop, you might have come across Twisted Threads lehengas and outfits. I keep sharing them because they are so good for the money you pay. It’s every bit paisa vasool. So, in this post I thought let me share EVERY SINGLE TWISTED THREADS outfit for you guys. Let me know which one is your favourite. All the outfits you see in this post are sample size outfits. If you order from Twisted Threads, the outfits will be made as per the measurements you give. You can place the order either through the brands Instagram or Facebook Account. Mode of payment can be through bank transfer, Paytm, western union, or moneygram. Payment has to be made in advance. You can pay 50% at the time of booking and the remaining before the outfit is shipped. Delivery Time is usually 18 to 20 days to complete one outfit. Twisted Threads ships worldwide. So if you are a US customer looking for something in the budget range, they are an excellent brand to go for. Divya who is the designer behind Twisted Threads also takes up customisations. So in case you have something particular in mind for your festive/wedding wear, do run it by her to see if it is possible to get it done. You never know, it might just be your lucky day. Once you shortlist an outfit from Twisted Threads, the brand sends across their measurement chart. You need to fill that out and send it to them first before doing the bookings. They are pretty smooth with their operation, so you will have a fuss free interaction with them. This gorgeous lehenga has been trending on Frugal2Fab Pinterest for months now. I know so many brides who have loved this look and it’s one hell of a stunner piece to wear. It has the right amount of shine with delicate detailing of the tassels. One of my top favourite outfits from their collection. This one is pretty new so you can definitely get your hands on this. It’s a pure dupion silk, crepe chiffon floor length Anarkali. I just love how cute those yellow contrasting tassels look with the baby pink dupatta. It’s a great trousseau piece to own. Plus, you can easily reuse the dupatta on any other simple Indian outfit you have. You know as sisters we typically don’t have that bomb of a budget that a bride gets for her big day. Of all the weddings I have witnessed, usually it is the sister who has to give in to a budget crunch. Let’s face it, irrespective of whether you have a 1 Lakh budget or a 5000 budget, you always want what can’t be yours. If you’re facing a serious budget crunch, opt for lehengas which have bold colours on it. Something like this one. The colour itself is the USP of the dress. It doesn’t need much to stand out. The colour itself makes it a stand out piece. if you don’t want anything too fancy-spansy, and still want that modern contemporary bridal look, then this is a super sweet option to go for. Bird cages were huge trends like last to last year. But since not many are wearing these now, you can still rock the trend. May be bring it back too. I absolutely love bird cage motifs. This one in particular looks so elegant with the red tassels. What do you think? This is a tye-dye on Pure cotton satin lehenga. The blouse fabric is art raw silk with dori and tikki work and it comes with a georgette dupatta with tikki work. Wear this for a fuss free colourful mehendi function. Another favourite of mine from their collection. The colour is totally on trend and the subtle contrast of yellow just pops the lehenga. Wear this to your mehendi or even to your besties wedding. You’re going to shine through. P.S. There is a gorgeous bow on the back of the blouse on this one. So pinky points for that. If you love florals, then this is a gorgeous piece to own. It comes with a criss cross blouse back design that’s give it an edgy modern twist. The fabric is a floral print pure cotton satin lehenga. I love every single piece that I am sharing in the budget bridal Lehenga section of Twisted Threads. This one in particular has a lovely bright pink colour with a gorgeous net baby pink dupatta. It comes with a pink raw silk threadwork embroidered blouse. You can easily doll this up with the right jewellery and make it your budget wedding lehenga. Ok. So I know the blog title says under INR 15k. But really, did you not want to see this one? You did, right? No harm in sharing in case you love-love this. Then going a bit over the budget might be ok to find that dream lehenga. I absolutely love this one for budget lehengas. It pink, yet shiny with sequins and handmade latkans. You can totally wear this as a reception night outfit. Notice those little gold details on the blouse sleeves? Pretty fantastic isn’t it? I always say a bride will look like a bride no matter what she wears on her big day. This particular lehenga might seem pre-wedding to some of you, but I say you can totally jazz this up for the main wedding function as well. Maybe add a more traditional second dupatta to put over your head. If you’re into the meetha lehenga colours, and don’t want to do the usual pinks and reds. Then this is a good option. Recently a bride chose to wear this gorgeous all gold sequins lehenga to her reception party. It looks fantastic and comes with this super cute bow on the back which gives it a very girly-girl feel. The outfit is above budget, I know. But it’s just so good. I just had to share, in case some of you are ready to splurge a little bit. P.S. It has little similarity to the Anushka Sharma reception lehenga. You know the gold Sabyasachi one. Look it up. You’ll know what I mean. Diwali is just around the corner. If you’re looking for something simple and sweet yet elegant, then this is my pick from Twisted Threads for you. That gorgeous colourful bandhani dupatta is the right accent piece with the otherwise plain white Kurti. This lilac net lehenga with sequins work comes with a cotton satin blouse and mukaish chiffon dupatta. This beautiful mint green Anarkali gown is perfect if you want something pretty for your mehendi function. You can also wear this to your sisters pre-wedding function. Net and tulle fabrics are big time trending this wedding season. Most of the premium designers charge anywhere from INR 50k to INR 1 Lakh+ for tulle skirt lehengas. If you’ve been eyeing a similar one for some time now, then this Twisted Threads outfit is perfect for you. Another one for the quirky lovers. If you are looking for something out of the ordinary without a big price tag, this is a good option to go for. It’s not everyday that one gets to see a grey lehenga out there. You can easily wear this for your siblings wedding reception or even for any of the pre-wedding parties. So many of you’ll ask me for alternative outfits to lehengas. So if you’re one of them, then this beautiful cocktail party evening gown is the look for you. Midnight blue looks amazing after sun down and is festive enough to wear for your engagement party or even for your pre-wedding sangeet/cocktail night party. Which Twisted Threads Outfit Was Your Favourite?